Developed and managed by the Coega Development Corporation (CDC), this pioneering multi-billion Rand project aims to drive local and foreign direct investments in export-oriented industries - positioning South Africa as the hub for Southern African trade. The Coega SEZ, while offering global competitiveness through world-class infrastructure, tax incentives, rebates and a duty-free zone, is purpose-built for manufacturing including beneficiation of export goods, investment and local socio-economic growth - skills development and job creation. Adjoining this, the largest SEZ in the Southern Hemisphere, is the Port of Ngqura - a modern multi-user deepwater harbour developed by the National Ports Authority of SA as a gateway to global markets. The Coega SEZ and the deepwater Port of Ngqura will remain catalysts for investment and local development. Coega focuses on offering the best solutions to prospective investors by assisting them every step of the way to ensure projects move from concept to completion. Coega has successfully attracted a healthymix of both local and international investors; and moved from the initial anchor tenant approach to focusing on strategically attracting a range of medium, large and mega projects to diversify and strengthen the industrial base. The achievements and successes of the Coega SEZ over the past couple of years have proven that a mixed approach to attracting investors is working. That said, however, a number of catalytic big projects valued at over R75-billion, are on the horizon and include PetroSA’s Project Mthombo which will enhance the attractiveness of the Coega SEZ as an investment destination and therefore future investment trends. by Coega Communication. Primary (disk) and Secondary (backup) file based storage provision. • Support with Safety, Health, Environment and Quality Services, for example EIA Process. Tax incentives, rebates and customs controlled areas. Business location purpose-built for manufacturing including beneficiation of export goods, investment and local socio-economic growth - skills development and job creation. South Africa is a low-cost and top location for ease of doing business. The general ease of doing business is enhanced by the SEZ advantages and incentives. South Africa is among the top ten globally for securing investor protection and sound fiscal governance. South Africa has a stable economy and market-oriented business culture. Strategic location at the crossroads of east- west trade routes globally and within Africa; presence of world’s major shipping and logistics companies; adjacent to a modern, deep-water port with container, bulk and break-bulk terminals. Availability of land customised for heavy, medium and light industries, serviced sites and fast-track construction of factories, warehouses and office complexes on 9 003 hectares of land. Zones 1 and 2 have been designed as a CCA to comply with SARS requirements. 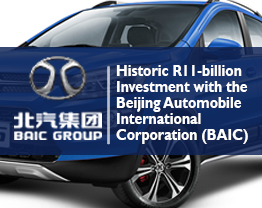 The CCA status will benefit investors like FAW in the automotive sector.